As a child I remember learning about Johnny Appleseed (John Chapman) in school. After eating a Jonathan apple at home I carefully removed the seeds from the core and wrapped them safely in a napkin. My plan was to plant them in the spring and eventually have a tree that would produce all of the Jonathan apples my heart could desire. At the time, I did not know anything about the reproductive life of plants, let alone animals. The apple tree is an angiosperm or flowering plant. Angiosperms make their first unmistakable appearance in the fossil record during the Cretaceous period (Kenrick & Davis 2004, p. 195). New reproductive strategies helped angiosperms become a great success and diversify into the forms we know today. Male and female structures develop within flowers. Many organisms such as birds, bats, and insects have coevolved to help pollinate angiosperms. Animals have also coevolved to help disperse the seeds of angiosperms. A variety of insects are attracted to the scent, color and shape of the apple blossom. The honeybee Apis mellifera is the major pollinator of apple trees. Some solitary bees like the orchard mason bee Osmia lignaria are much more efficient at pollinating apple blossoms and are used by many orchards. However, it is the ability to produce honey (which humans desire) that has made Apis mellifera the primary pollinator. The honeybee eats the nectar and collects pollen (a good protein source) to feed their larvae. As the bee visits different flowers it becomes coated with pollen, which gets transferred to other flowers on other trees. 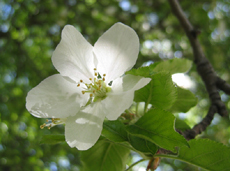 Although the apple blossom has both male and female parts (the apple tree is a hermaphrodite), it is self-incompatible. Apple trees require cross-pollination (Browning 1998, p. 19). So, when the pollen of one apple cultivar or crab apple comes into contact with a flower on a different apple cultivar, specifically the stigma on that flower, the growth of a pollen tube is activated. Click on flower image to enlarge. Each pollen grain carries two sperm. In the domestic apple Malus pumila each sperm and egg contains 17 chromosomes. One sperm fertilizes the egg in the ovule; the other sperm unites with two haploid cells in the same ovule. This process is known as double fertilization and is an important adaptation found in angiosperms. The fertilized egg with 34 chromosomes will undergo cell division to become a zygote and then an embryo. The second fertilization results not in offspring, but rather the development of endosperm, which acts as a nutrient for the embryo. Note the cells in the endosperm have three sets of chromosomes or 51 in this case. The endosperm not only serves as an important food source for the embryos of flowering plants it also is important to other animals. Humans depend upon the endosperm of rice, wheat, and corn. Recent research indicates the endosperm may also act as a fertilization sensor helping to abort embryos of incompatible crosses (Juniper & Mabberley 2006, p.27). 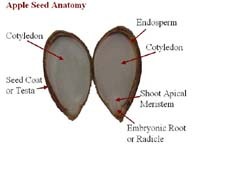 A seed is formed when the endosperm and the embryo become enveloped in a part of the ovule that hardens into the seed coat. 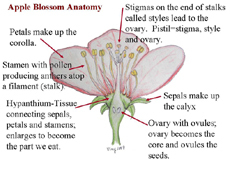 The ovary or other parts of the flower in angiosperms develop into a fleshy fruit surrounding the seeds. The apple is a type of fruit called a pome. The calyx forms a tube and the hypanthium becomes a fleshy pome surrounding the true fruit made of five carples each encasing 2 to 3 seeds. Click on seed image to enlarge. The fleshy fruits of angiosperms are an adaptation for seed dispersal. Many animals use the fruit as a food source, which results in the dispersal of seeds encapsulated within a natural fertilizer! Each seed in every apple represents a unique combination of genes brought together through sexual reproduction. The fact that each seed is unique helps to ensure that the apple tree can adapt to many different environments. The seeds I wanted to plant, as a child, would have each produced a unique tree with unique apples. How do we get an entire orchard of apple trees all producing identical fruit? The answer is cloning. If you find a particular apple tree that produces excellent apples, budding or grafting can be used to clone the tree. A twig with buds, called a scion, can be taken from the desired tree. The scion and an apple grown from seed are given compatible cuts that will fit like puzzle pieces. The tissue between the bark of both stems must be carefully lined up, so that the cambium layers match. The cambium is tissue between the bark and wood, it produces water-conducting tissue called xylem (which helps make up the wood) towards the center of the plant and food conducting tissue called phloem towards the inner bark layer. Without a healthy cambium layer trees cannot survive. 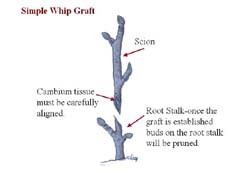 The graft is sealed with wax and bound together with cord or tape. Budding is a type of grafting in which a single bud of the desired tree is used. 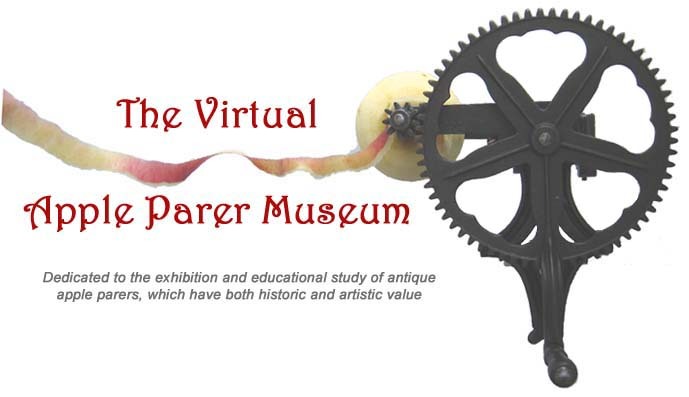 Click on graft image to enlarge. Sometimes you can get good apples by crossing two different apple trees. The Pink Lady apple is a hybrid between Golden Delicious and Lady Williams (Juniper & Mabberley 2006, p.176). However, to get an orchard of trees that produce Pink Lady apples you will need to do a lot of grafting because each seed in a Pink Lady is a unique genetic combination! Remember, once you have your orchard of clones you will need the pollen provided by another compatible apple cultivar and some busy bees to produce your crop! Browing (1998) reminds us that the work does not end here; just as the American colonists, French, Celts, Romans, and Persians discovered before us, this human-made monoculture will require intense pruning and pest management to be successful (pp. 33-34).